Not to be confused with Fulton, Oswego County, New York or Fulton, Schoharie County, New York. Fulton County is a county in the U.S. state of New York. As of the 2010 census, the population was 55,531. Its county seat is Johnstown. The county is named in honor of Robert Fulton, who is widely credited with developing the first commercially successful steamboat. 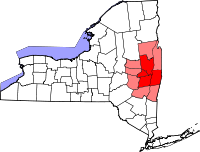 Fulton County comprises the Gloversville, NY Micropolitan Statistical Area, which is included in the Albany-Schenectady, NY Combined Statistical Area. In 1838, Fulton County was split off from Montgomery, shortly after the Montgomery county seat was moved to Fonda, New York. The creation of Fulton County was engineered by Johnstown lawyer Daniel Cady, whose wife was a cousin of Robert Fulton. Fulton County was created on April 18, 1838 by a partition of Montgomery County, resulting in a county with an area of 550 square miles (1,400 km2). The old Tryon County courthouse, later the Montgomery County courthouse, became the Fulton County Courthouse, where it is New York's oldest operating courthouse. One adjustment has been made to the area of Fulton County. On April 6, 1860, 10 square miles (26 km2) on the northern border was transferred to Hamilton in the vicinity of Sacandaga Park. This resulted in the Fulton County that exists today. In the mid-18th century, Sir William Johnson, founder of Fort Johnson in Montgomery County and of Johnstown, arrived in what would become Fulton County. Sir William Johnson, 1st Baronet, was an Irish pioneer and army officer in colonial New York, and the British Superintendent of Indian Affairs from 1755 to 1774. His homes, Fort Johnson and Johnson Hall are current New York State Historic Sites. Fulton County was also home to Elizabeth Cady Stanton, a central pioneer in America's women's rights movement. Shortly after the American Revolutionary War, the manufacture of gloves and leather became the area's primary industry. At one point, Johnstown and Gloversville were known as the world's Glove and Leather capital. The largest rise in population and growth came as a result of the fruits of these businesses. Many residents of Fulton County can trace their ancestry to the glove and leather trades. Today few glovers, tanners and leather dressers remain in the area, although some companies have adapted to the changes in the market to remain competitive. According to the U.S. Census Bureau, the county has a total area of 533 square miles (1,380 km2), of which 495 square miles (1,280 km2) is land and 37 square miles (96 km2) (7.0%) is water. Fulton County is in the central part of the state, northwest of Albany, lying in the southern Adirondack Mountains. Approximately 58% of the county is within the boundaries of Adirondack Park. As of the census of 2000, there were 55,073 people, 21,884 households, and 14,509 families residing in the county. The population density was 111 people per square mile (43/km²). There were 27,787 housing units at an average density of 56 per square mile (22/km²). The racial makeup of the county was 95.99% White, 1.80% Black or African American, 0.19% Native American, 0.53% Asian, 0.02% Pacific Islander, 0.56% from other races, and 0.91% from two or more races. 1.61% of the population were Hispanic or Latino of any race. 17.2% were of Italian, 16.4% German, 13.2% Irish, 10.0% English, 8.3% American, 5.8% French and 5.7% Polish ancestry according to Census 2000. 96.1% spoke English and 1.6% Spanish as their first language. There were 21,884 households out of which 30.50% had children under the age of 18 living with them, 50.00% were married couples living together, 11.30% had a female householder with no husband present, and 33.70% were non-families. 27.70% of all households were made up of individuals and 12.90% had someone living alone who was 65 years of age or older. The average household size was 2.43 and the average family size was 2.94. In the county, the population was spread out with 24.90% under the age of 18, 7.20% from 18 to 24, 28.10% from 25 to 44, 23.60% from 45 to 64, and 16.30% who were 65 years of age or older. The median age was 39 years. For every 100 females there were 97.10 males. For every 100 females age 18 and over, there were 93.60 males. The median income for a household in the county was $33,663, and the median income for a family was $39,801. Males had a median income of $29,538 versus $22,173 for females. The per capita income for the county was $16,844. About 9.20% of families and 12.50% of the population were below the poverty line, including 17.50% of those under age 18 and 7.50% of those age 65 or over. Fulton–Montgomery Community College is in Johnstown, New York. ^ Gannett, Henry (1905). The Origin of Certain Place Names in the United States. Govt. Print. Off. p. 133. ^ New York. Laws of New York. : 1838, 61st Session, Chapter 332, Section 1, Page 328. ^ New York. Laws of New York. : 1860, 83rd Session, Chapter 178; Page 298. ^ Fulton County Public and Private Airports, New York. Retrieved June 13, 2013. "Glovers and Tanners of Fulton County"